The internet is full of reports, tools, blog posts and so much information, even if you were to focus on a single topic in a single area, it would take 100 lifetimes to review and filter it all. For this reason, all of us depend on credible, trustworthy experts who have gone before us to filter out the garbage, fluff, and nonsense so we can invest our precious time with ideas and information that is tested, proven and relevant. While I look forward to chatting with you via email or phone sometime (see that big box on the right? ), you may want to simply download some freebies WITHOUT exchanging information. So, in the spirit of “Paying it Forward”, here you go. For the busy entrepreneur, author or online marketer, automation is critical to increasing your business, saving time and expanding your wallet. (And not go crazy in the process). I’ve tested, used and compiled my top 13 tools that have saved me oodles of time. No opt-in. Just click and enjoy! That is not a typo, but it does confuse most people. All business owners know the path to growth is to scale their operations. Anyone with experience also realizes that employees are the largest expense item (in term of money and frustration). Welcome to the world of the virtual assistant or remote worker. No contract, low wages and…well…it’s never as easy as it seems. I have a few years experience in this area and have built a solid, professional and affordable team to help me grow. Click here and you can too. We are launching a full-blown, Youtube strategy program for authors and marketers in 2015. It will assist authors in creating movie-style “trailers” to better position their books. In addition, the speedy course materials will have a ‘Done With You’ option to help busy entrepreneurs get their video’s ranked highly, working intelligently and creating a flood of inbound inquiries. 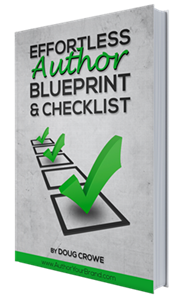 For a limited time only (until the full course is ready for publishing) you get the checklist for FREE! Now, there are a few other items that, if you’ll permit me to share, do require an opt-in, but I triple promise, pinky swear you’ll find the value exchange weighing heavily in your favor. I’ve been following crowdfunding sites like Kickstarter and Indiegogo for a few years. I even interviewed Gary Goldstein, producer of Pretty Woman on how he successfully crowdfunded his book. The growth curve of crowdfunding is doubling every year. It is no longer an experiment and is nowhere near over crowded. It’s time to get in. This checklist will help you get there. I’ll continue to add cool stuff here from time to time. Meanwhile, see that pretty green box on your upper right of the page?